I built a water powered hammer called a “Monjolo”. 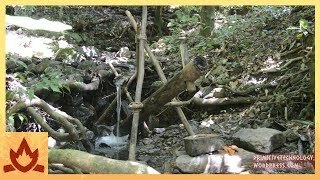 I started by making a water spout from half a hollow log to direct water from the creek. This was set up in the creek and water flowed through it. The hammer was made from a fallen tree. I cut it to size by burning it at the points I wanted it cut (to save effort chopping). Next I carved a trough in one end to catch falling water. This was done first with a stone chisel that was then hafted to an L–shaped handle and used as an adze. This adze only took about an hour to make as I already had the chisel head and cordage made of bark fibre to bind it with.